The influx of Central American children trying to cross the border from Mexico into the U.S., many of them unaccompanied, has been a major media story over the past two months. The White House and many Democrats have clashed with Republicans in Congress and governors over who is to blame and what should be done about it. President Barack Obama has requested nearly $4 billion to deal with the crisis on the southern border but a House Republican plan would provide less than a quarter of what Obama's asking. Last month, Obama said he was starting "a new effort to fix as much of our immigration system as I can on my own, without Congress." With the bipartisan immigration reform bill passed last summer by the Senate all but dead in the GOP-controlled House, Obama said that "if Congress will not do their job, at least we can do ours," adding he expected the recommendations by the end of summer and would act on them without delay. Asked about the reported proposal to give work permits to undocumented immigrants, White House Press Secretary Josh Earnest said, "What is underway right now is a review at the order of the President by the secretary of Homeland Security and the attorney general to consider what options are available to the President." Earnest added that once that review is complete, "I anticipate that we'll have an announcement about steps that the President has decided to take to address some of these problems." A large scale move by the White House on immigration could cause instant fireworks. Conservatives would yell "amnesty" - their interpretation of a pathway to citizenship for those who entered the country illegally - and the roster of Republicans calling for Obama to be impeached would surely increase. The move would have instant reverberations on the campaign trail, with one third of the Senate and the entire House being contested in November. Democrats have a 55-45 majority in the Senate (53 Democrats and two independents who caucus with the party). But in the midterms, the party is defending 21 of the 36 seats up for grabs, with half of those Democratic-held seats in red or purple states. In the House, the Democrats would need to pick up an extremely challenging 17 Republican-held seats to win back the majority from the GOP. Facing a lawsuit by House Republicans and calls for impeachment, Democratic strategist and CNN contributor Maria Cardona said the President "at this point has nothing to lose and everything to gain." "It will energize the base and will energize Latino voters - to what extent is the question but every little bit helps since there are enough eligible Latinos in enough swing districts that could register and vote - that could flip the House," Cardona said. A larger turnout by Latino voters could be crucial, because a typical, smaller midterm electorate should favor Republicans. That's because minority voters such as Latinos, and younger people and single women, all of whom are big supporters of Democrats in presidential election years, tend to cast ballots in smaller numbers in the midterms. Republican strategist and CNN contributor Ana Navarro disagreed with Cardona's assertion, saying the President is "in such a box" when it comes to immigration. "Politically, he's under huge pressure from immigration advocates and Latino leadership. Midterms are approaching and Hispanics, a key part of the Democrat coalition, are disillusioned and unmotivated. Obama has gone from 'President Si, se puede,' to the 'Deporter-in-Chief,' " Navarro said. Longtime GOP consultant Alex Castellanos says an executive order by Obama could hurt fellow Democrats facing tough re-elections this year. "If you are a Democrat in a swing district, Barack Obama has just made your life impossibly difficult, charging up your opponent's voters and giving him a couple of extra points in November," said Castellanos, who predicts a GOP wave in November. "President Obama doesn't seem to care what he does to his own party. He seems to be willing to sacrifice the U.S. Senate and more seats in the House to make this a borderless country," added Castellanos, a CNN contributor. The crisis on the nation's southern border appears to be fueling a notable shift in American attitudes toward immigration policy with border security growing in importance, according to a new national survey. According to a recent CNN/ORC International poll, 51% now say the government's focus on immigration policy should be formulating a plan to stop the flow of undocumented immigrants. Forty-five percent say the top priority should be developing a plan that would allow undocumented immigrants who have jobs to become legal residents. That's a change from February, when Americans said 54%-41% that legal status trumped border security. The attention the current crisis is receiving is also fueling a spike in those who say the issue's extremely important. Thirty-nine percent now say it's extremely important for the President and Congress to deal with illegal immigration, up 10 points from last year. With all the attention now focused on the issue, any move by the President will be under the microscope. If Obama pulls his giant amnesty move, almost all of the Democrat Senators up for re-election in November will be gone, as will Harry Reid from Majority Leader! Please Obama, MAKE MY DAY!!! The only people talking amnesty are you folks on the Right. The President has said the vast majority of these kids are going to be deported- and that's because the law says so. Stop with your fear-mongering lies. 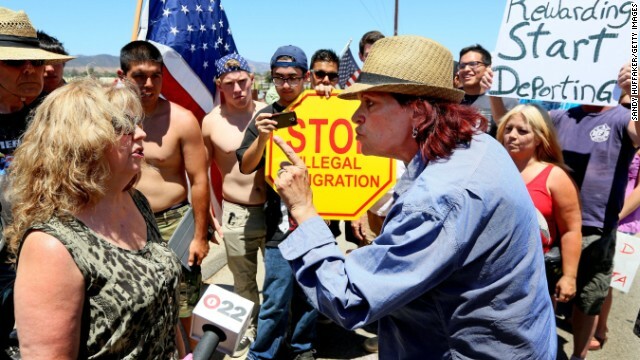 why is that spanish woman sticking her finger in the face of an american citizen like that? How do you know she's Spanish? She looks like an obese hillbilly. The voters will turn out every single Dem up for re-election, for sure. They will ALL lose! You gotta love the picture to go with this story... A finger-wagging older white woman (Tea Party Patriot???) furious as Hell at all these brown people trying to get in this country. I'm sure she's convinced none of this would be happening if Romney or McCain had won. Thank you CNN for responsible reporting. If the information that Obama was planning on rewarding illegal immigrants with work permits was not revealed, Obama would have initiated it without the consent of the American people. Can't we screen these illegals , if they act like Ted Cruz or Marco Rubio , we give them a visa , if not DEPORT THEM ! Dems cam loose the senate and house but don't forget the bills passed by the GOP will have to go across Obamas desk for final signing. I don't think Obama will forget what the GOP has done to him for the last 6 years. GOP will pass a ton of bills if they have both houses which will show America it was all about Obama why they haven't done anything for 6 years. Best way to keep your blood pressure down is NOT to let things or people that mean nothing in your life get under your skin and to not keep things that truly annoy you bottled up inside. Ain't that the truth? The fact that they think they DO get under our skin is laughter enough. And moving on ... I spent the day stocking the freezer with pre-cooked meals for the hubby; got some cleaning done; and have the car packed and ready to go. I'm heading for the lake for a bit of stress free jigsaw puzzles and a book or two. Rocking chair, but no knitting needles ... I quilt, not knit. Total peace and quiet. No phones, no cable, no internet. Obama amnesty will be the death knell of Democrats in the mid-terms. Who, other than Rahm Emanuel (who wantsto bring 1,000 "unaccompanied minors" to Chiraq), who thinks it is a good idea to open our borders to wave after wave of illegal immigrants (who will immediately become citizens and registered voters with a stroke of the Obama pen). You brought 'em Barack, you send 'em home! Secure the border and deport illegals! I support the president but if he gives amnesty through executive action , he is WRONG. We have our own children in need waiting in foster homes for sponsors. We have elderly that have to choose between medicine or food. We have veterans dying because they have been put on secret lists waiting for their earned benefit of healthcare.They want compassion, what about our marine that Mexico has held in captivity for 6 months just because he made a wrong turn and ended up in Mexico. but ti will be too late. So 0bama is just going to let the millions of illegals compete with americans in a very challenging job market ? Thats not good ppl . If you cannot beat an 'illegal' who cannot speak our language out of a job, then that is much more of a reflection on you than it is Obama. Dear God, please answer my prayers and put a real leader in the oval office. Our country is in the fast lane to decline. If you do consider answering my prayers, please also consider taking additional trash such as Biden, Pelosi, Reid, Holder, etc.